The "Jack Attack'', A.K.A. Jack Stanley and Jack Jennings, put on quite a show at Holmdel Park as the dynamic duo from Mendham delivered a knockout punch in the Group 3 race at Saturday's NJSIAA Group Championships. 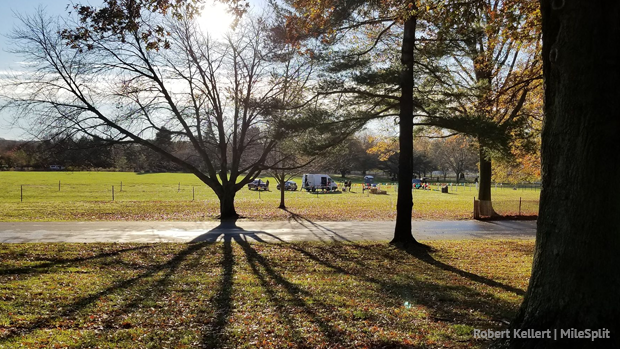 Stanley won his second straight state title in 15:45, a 15 second Holmdel Park PR, and Jennings was second in a Holmdel PR of 15:52 to spark NJ #5 Mendham to its second consecutive Group 3 title and third overall. Stanley and Jenings also went 1-2 last year. 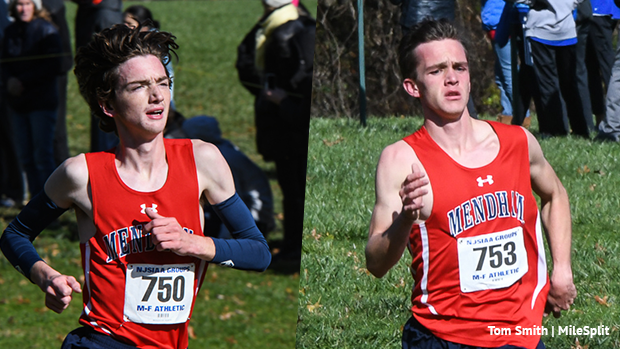 Thanks to Stanley and Jennings, who were the only runners to break 16 in the blustery conditions, Mendham ran the fastest team average of the day (16:38) and rolled to its second straight title and third overall, 62-99 over Morris County rival and NJ #9 Morris Hills. Mendham was one of four boys teams to repeat as champions. NJ #1 Christian Brothers Academy, NJ #2 Haddonfield, and NJ #4 Kingsway also captured championships for the second straight year. What Kingsway did in Group 4 is simply amazing. How many teams lose five of its top six runners from a state championship team and come back and win it again? The Dragons did just that as coach Christian Lynch's pack outscored Westfield 91-97. Kingsway went 8-9-14-18-42 and averaged 16:49. NJ #3 Westfield went 7-12-20-23-35 and averaged 16:52. CBA, the defending Non-Public A champs, held out some its top guns, including Tim McInerney and Luke Reid, but still had no problem extending its state record to 29 state titles. Shaw Powell, a junior who transferred in this year from Jesuit High School in Oregon, led the charge for the Colts by winning the race in 16:14. Powell's is the 14th state XC champ from CBA, which went 1-5-9-11-17 for a 43-84 victory over St. Peter's Prep. CBA, which averaged 16:48, will be seeking its second straight M of C title and state record 23rd overall next Saturday. If CBA wins its 23rd M of C title it would own just as many titles as the rest of the state combined. That's right, CBA has won 22 of the 45 M of C titles. How crazy is that?? NJ #2 Haddonfield and Haddon Township, two of the state's most dominant programs, added to its rich tradition of excellence. In the Group 2 race, Haddonfield put six runners in the top 23 on its way to a 42-75 victory over runner-up Voorhees to capture its 17th state title. That's the third most in state history behind CBA (29) and Bernards (23). Haddon Township raised its state title total to 12 with a dominating performance in Group 1 as Haddon Township outscored runner-up Hasbrouck Heights, 80-126. Hasbrouck Heights advanced to the M of C for the first time ever. Sebastien Reed of Pitman said everyday in gym class he looks up at the banner that lists the lone boys state XC champion from his school and has always envisioned having his name added. Mission accomplished! Reed, running a perfect tactical race, reeled in a fast starting Jared Cooper of Mountain Lakes just before the one-mile mark, charged ahead as he went into the bowl, and blasted away from Cooper and the rest of the field over the final mile to win the Group 1 race in 16:18, a Holmdel PR of 22 seconds. Reed joins Kevin Schlling (1991) as Pitman's only boys to win state XC titles. In Group 2 race, Devin Hart of Point Pleasant Boro, the state's No. 1 runner, easily repeated as champion in 16:00. With three huge races coming up, Hart predictably stayed off the gas and ran a very comfortably the whole way. The Stanford-bound Hart said there will be not holding back next week when he looks to throwdown one the fastest times in Holmdel Park history when he defends his M of C title next week. Only five runners, Edward Cheserek of St. Benedict's (14:53), twins Joe Rosa (14:56) and Jim Rosa (15:15) of West Windsor-Plainsboro North, Craig Forys of Colts Neck (15:16), and Jason DiJoseph of Paul VI (15:17) have run under 15:20 at Holmdel. Hart said is goal is to become the sixth. 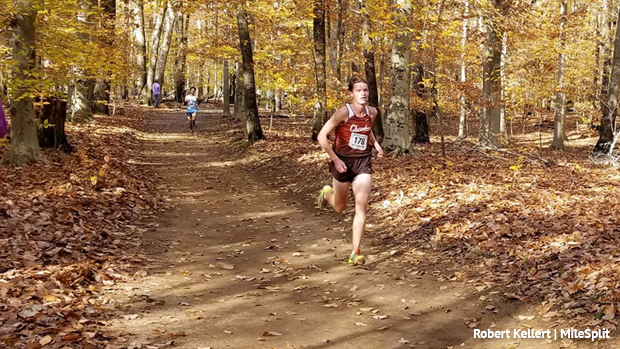 Ethan Wechsler of Cherokee, 35th in the Group 4 race as a sophomore last year, continued his breakout junior season by winning the Group 4 title in 16:08. Wechsler is the fourth boy from Cherokee to win a state XC title. Joe Halin (1999), Marc Pelerin (2001), and Shawn Wilson (2012) are the other three. In the Non-Public B race, Newark Academy won its second title ever (the other was in 2015) with a 54-103 victory over Bishop Eustace. Newark Academy finished 5-8-11-13-17 and had a 34 second compression. Connor Melko of Bishop Eustace, 23rd as junior last year in the Non-Public A race, ran 16:50 to capture the Non-Public B individual title to become just the second boy from his school to win a state XC title. Paul Rabon, who won in 1982, and '83 is the only other boy from Bishop Eustace to win.